Oopsy’s creator Robert (Bob) J. McNea was born in St. Thomas, Ontario Canada on June 12th, 1929. By the time he was six the Great Depression had been sweeping through the country. Times were difficult and happiness seemed illusive, even for a small child. While paging through a magazine he came upon a clown photo of Felix Adler. From that moment on Bob knew he wanted to be in show biz. Bob McNea’s first television appearance was in the summer of 1950 while promoting the Michigan State Fair GrandStand Show on WXYZ-TV in Detroit Michigan. Early television was broadcast LIVE in black & white including commercial breaks. Bob became the Wonder Bread spokes-character for the “Mickey Mouse Club” (WXYZ) in 1959. 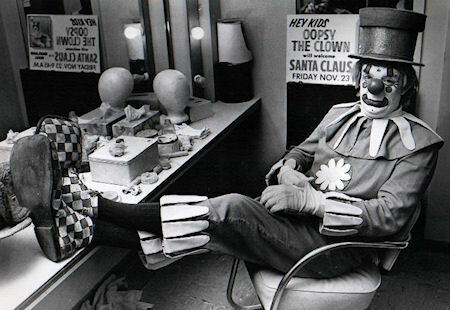 Bob won an audition at WWJ-TV to portray the televised character “Bozo the Clown”. It became Detroit’s favourite kids show televised in a 1/2 hour live-to-air format six days a week in front of a studio audience for the next eight years. When WWJ executives decided not to renew the licensing for Bozo in 1967, Bob was given the opportunity to fill the time slot with his own clown character which he called “Oopsy Daisy”. The American “Oopsy Daisy” show continued for another 12 years until Bob negotiated a deal which relocated production to the Canadian CTV affiliate, CKCO-TV in Kitchener, Ontario. Through his production company Sumfun, Bob, his wife Frances Kay, son Michael and daughter Kathy McNea wrote, produced, acted and developed puppet characters on the “Oopsy the Clown” show for another 12 years. During the same time, they produced “Big Top Talent”, a television program showcasing amateur talent of kids from cities, towns and rural areas surrounding the Kitchener Waterloo area. Oopsy was the on-camera host for 16 years.